The Tuxco Model TC-28 Hydraulic Tire Constrictor utilizes hydraulic force to seat tire beads of tubeless tires up to 25 feet in circumference. By applying a predetermined force of up to 15,000 lbs, the TC-28 spreads the tire beads against wheel rims evenly and tangentially. The TC-28 can be used to mount 14 to 30 bias ply tubeless tires. 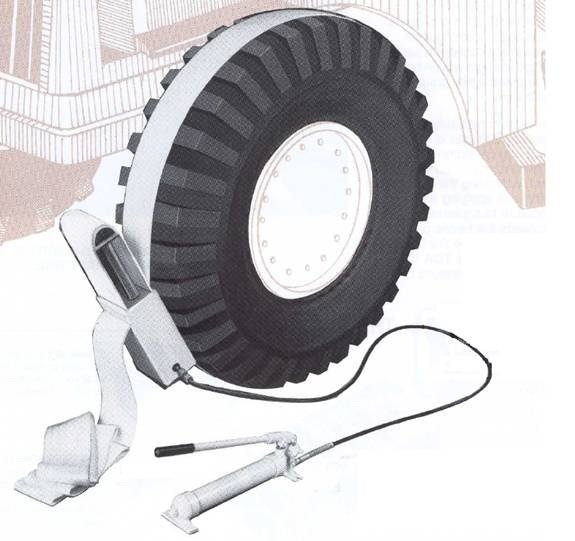 The Tuxco constrictor adjusts easily to the tire circumference, while the hydraulic pump incorporates an automatic pressure relief bypass making it by far the safest method of mounting large, heavy, difficult-to-handle tires. The Tuxco TC-28 Hydraulic Tire Constrictor is superior in every respect to such tire constricting devices as chains, steel rings, rubber donuts, and the “air-explosion” method. The Tuxco Model TC-60 Hydraulic Tire Constrictor is the most efficient tool when forcing bias ply tire beads against the wheel rim to facilitate inflation. 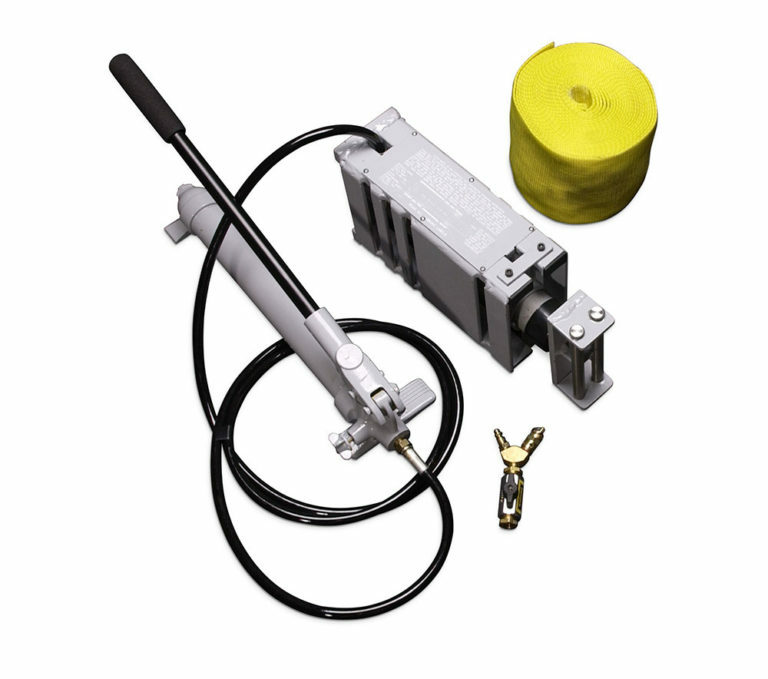 The operator can hydraulically apply up to 15,000 lbs. of force tangentially and evenly to the circumference of the tire, while maintaining the pressure until the bead seats. A simple valve safely releases the belt pressure as the tire inflates. The TC-60 Hydraulic Tire Constrictor can be used to mount 6 to 14 bias ply tubeless tires. The Tuxco TC-60 Hydraulic Tire Constrictor is superior in every respect to such tire constricting devices as chains, steel rings, rubber donuts, and the “air-explosion” method. The Tuxco Model TC-90 Hydraulic Tire Constrictor is the most versatile hydraulic tire constrictor available on the market for mounting bias ply tubeless tires. Choose from either a manual hydraulic pump or the faster, air powered hydraulic pump to seat the beads on wheels that are either on or off the vehicle. The Tuxco TC-90 Hydraulic Tire Constrictor can be used to mount 6 to 30 bias ply tubeless tires. The Tuxco TC-90 Hydraulic Tire Constrictor is superior in every respect to such tire constricting devices as chains, steel rings, rubber donuts, and the “air-explosion” method.